Seriously, I know what your thinking...why does LaShelle have a pile of rocks pictured here? Well I work for a company that is always looking for better, less expensive ways to remanufacture our components. One way was to upgrade to a bigger, better "vibe" machine that polishes components after the wash cycle getting them ready for further processing. Well when we went to the upgrade we needed to dispense of the old media for a different type of media. We call these "stones". I'm not sure about what they are made of to tell the truth but a light bulb went off in my head the day they asked me to empty the machine out and get rid of them. "May I have them?" 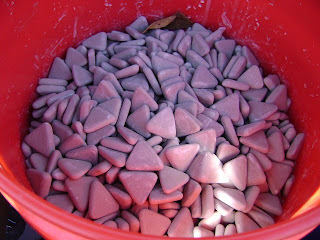 just came pouring out of my mouth and I'm not much of a pack rat but for some reason I thought, hey I think those would be cool if I could use those in mosaic foot stones for a neat path in my yard. I'll just make those into big round mosaic foot stones and maybe I can color/paint them somehow and well, my mind just wandered. So someone I work with took them to my car and we loaded them up after work. The majority of them are still in my trunk about 170 pounds of them. The next day I asked our skilled trades guys what it would take to drill a hold in each one (now I'm thinking "hey I'm going to bead with them") and they told me they could but it would take a ceramic drill and they might have time to do a couple or so a day. Well I hate to impose on people so I dropped the idea of putting holes in them and came home thinking "oh great now i have a bunch of rocks in my trunk and am I really going to make them into stepping stones"? I have a terrible time finishing anything major so I put the whole thing to rest and just have been carrying a trunk full of rocks in my car; until yesterday! 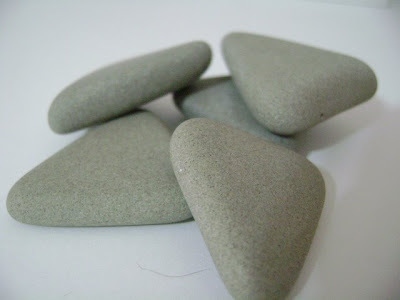 I began looking at my little pile of rocks on the table in my studio and the wheels began turning in my head. Now grey can be pretty but I wanted color. I went to a nearby craft store and found some paint but not knowing what I have as far as material in this "rock" I wasn't sure which kind of paint to get so I purchased a bottle of the prettiest pearlesque paint I could find. Purple is one of my favorite colors so I couldn't go wrong. "I'll use it on something" I thought. So I took one triangle stone and began painting. It dried very fast and I used my nail and tried to scrape it away but it was very set and hard to scrape off so I put a second coat on it. 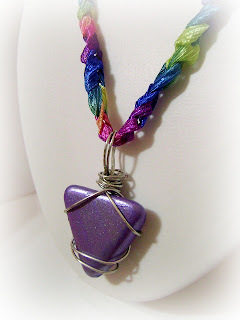 After it all dried I wire wrapped it with 22 gauge silver wire to make a pendant out of it and crocheted a multi color ribbon for the necklace. This is the final outcome and I really wanted to share it with anyone that had an interest in seeing it. I love what you did with this! Looks great. I was thinking you could also paint pics on them. I can see painting a number of these to look like candy corn and putting them out in a pretty bowl at Halloween. Or painting them as pumpkins. If you get tired of those, I'll take a few off your hands! What are these plants called?